It was sunny day morning with clear blue sky, we were all gathered, excited to witness arrival of our brand new GE Signa Pioneer 3 Tesla MRI machine arrived on a huge truck and a giant crane was ready to unload it at our site, that moment I thought its a big step in Neuroimaging from my institute to improve patient care. 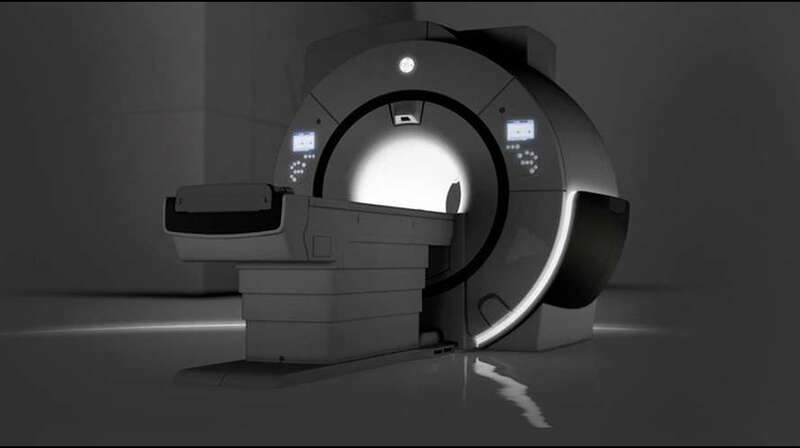 Solapur district’s first brand-new 3 Tesla MRI machine is twice more powerful in terms of its magnetic strength compared to 1.5 Tesla which we were previously using. Let me take a moment to introduce myself, I’m Dr Balaji Anvekar, did my Fellowship in Neuroradiology from Nanawati Mumbai and recently cleared my FRCR exam which was held at Royal college, London. I am serving Dr Valsangkar’s Neuroimaging Department for more than 11 years and it has been a dream to bring highest level of advancement in Neuroimaging to my town and this machine is the start of a new age of diagnosis for us. This machine will allow us to image fine brain details with significantly reduced scan time by half using new technology called MAGiC sequence without compromising image quality with features like automatic motion correction compared to our previous 1.5 Tesla machine. 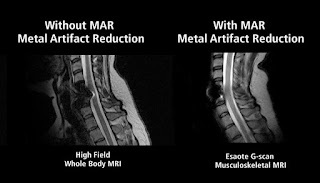 MAGiC for doing more patients per day that can be considered possible as it can generate multiple contrast images in a single MRI scan including T1, T2, STIR, T1 FLAIR, T2 FLAIR* and PD images in a single acquisition. With this SilentSuite, which is both revolutionary and proprietary, the SIGNA Pioneer reduces dB levels from an ear-splitting motorcycle-level 91dB to within 3dB of scan room ambient noise. 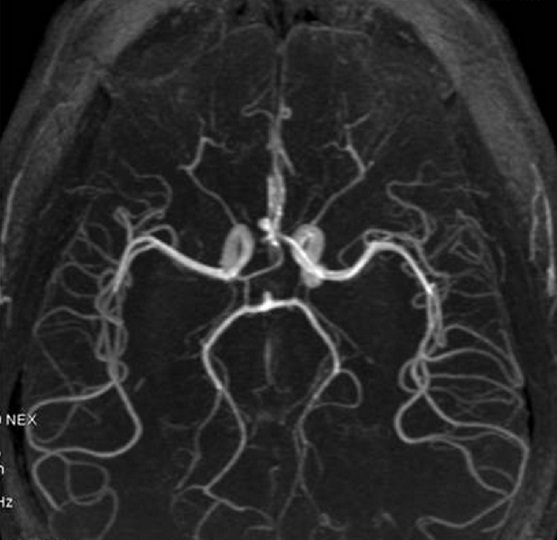 This dramatic advance comes first-ever with complete Silent Neuro Exam that includes Diffusion Weighted Imaging. This machine is going to have great impact on enhanced diagnostic possibilities by improving image quality, detection of smaller lesions like micro hemorrhages in hypertensive, diabetic patients and in patients with amyloid angiopathy. 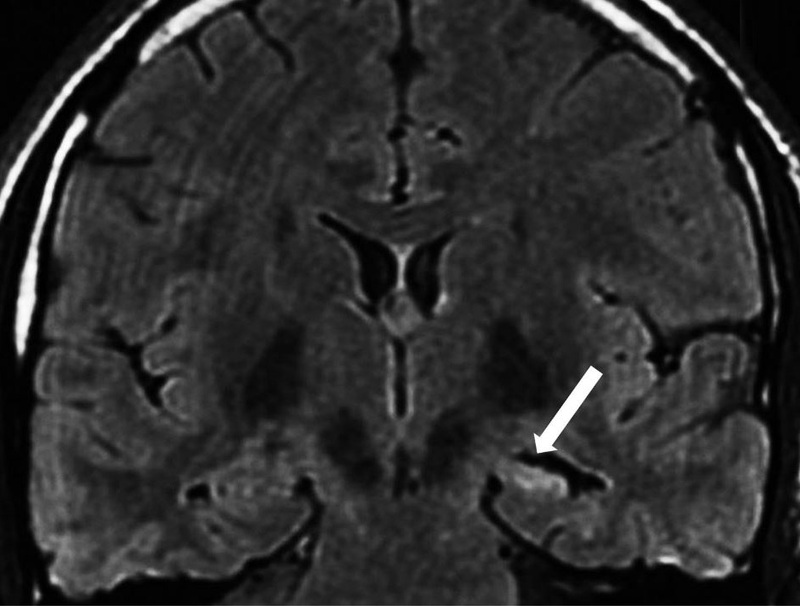 SWI demonstrating bilateral symmetric low signal in basal ganglia in patient with Neurodegenerative conditions with iron accumulation like ferritinopathy. 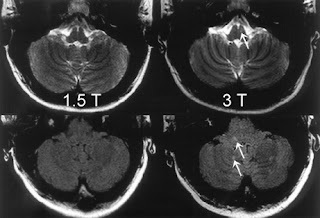 Low signal staining involving bilateral substantia nigra of mid brain suggestive of absent normal swallow tail sign and bilateral red nuclei suggestive of panda sign on MRI SWI images consistent with clinical diagnosis of Parkinsonism. 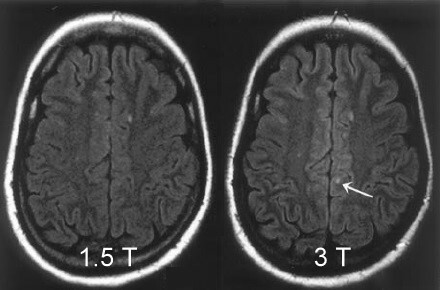 Same patient's MRI brain images on two different machine, show more number of lesions on 3 Tesla owing to its high sensitivity to catch lesion vs 1.5 Tesla MRI. Subtle lesions of focal cortical dysplasia and mesial temporal sclerosis in epilepsy patients seen more conspicuously with advent of sequences like double inversion recovery. Detection of vascular malformations like aneurysms in patients with subarachnoid haemorrhages by Non contrast 3D TOF Brain Angiography, detection of stenotic lesions at carotid bifurcation with more accuracy in stroke patients by Non contrast 2D TOF Neck Angiography, Cortical vein thrombosis by using 2D TOF MR Venography. 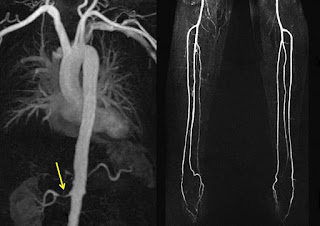 Detection of Renal Artery Stenosis in patients with refractory hypertension and Extremity Angiography with state of art image quality, surprisingly all this without using intravenous contrast. This is going to be helpful for patients like those with renal failure or pregnancy in which one can't use contrast. Metal Artifact Reduction and so the image distortion can be reduced by using MAVRIC sequence in patients with Metallic Prosthesis. 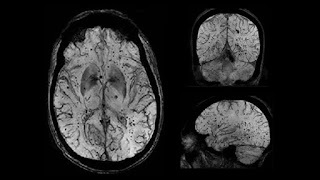 Diffusion Tensor Imaging, Fiber Tractography to demonstrate Brain's White matter Tracts, its involvement or relation with the lesion in cases of Brain tumors, Quantitative estimation of Diffuse Axonal Injury in Trauma cases. 3D Arterial Spin Labeling (3D ASL) technique for evaluation of quantitative perfusion of lesion for its benign vs malignant features without using Contrast. 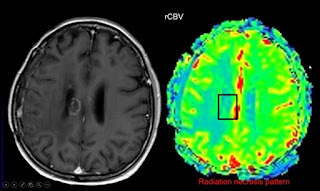 Estimation metabolites of brain and brain lesions like NAA, Creatinine, Choline and Choline / Creatinine Ratio in vivo by using MR Spectroscopy, Vascularity and Angiogenesis of lesions by using Perfusion imaging to differentiate Abscess from Tumor, Radiation induced necrosis from Tumor Recurrence is going to be easier now. Use of Perfusion imaging in Tumor evaluation to differentiate Radiation-induced necrosis from tumor recurrence. 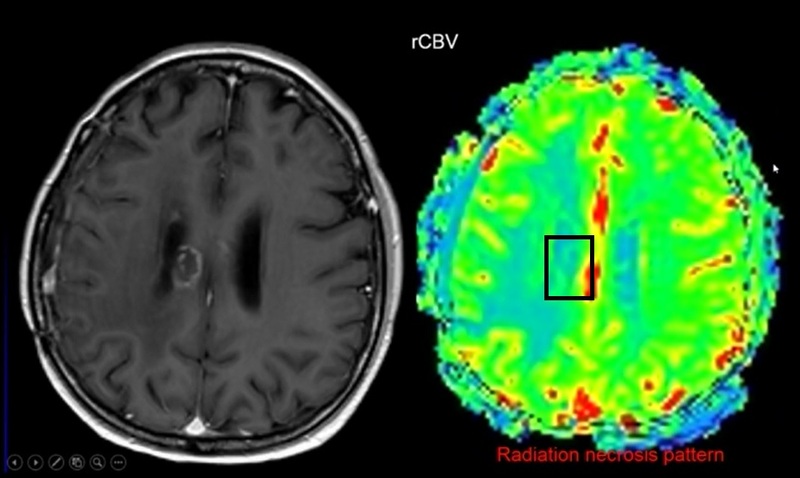 A hypo perfused lesion with peripheral enhancement due to central non-enhancing necrosis with low rCBV, rCBF values goes in favor of pseudo progression of radiotherapy rather than tumor recurrence as in this case. 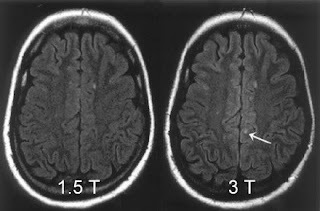 CSF flow analysis, estimation of Csf flow in ml / beats across cerebral aqueduct in patients with Normal pressure hydrocephalus to distinguish shunt responsive from non responsive patients, Arnold chiari malformations, aqueductal stenosis. A new and unique technology to locate motor and sensory areas of brain, its relation with the brain tumor pre operatively and is possible only with this machine or can be done really in a better way with this machine. Performance of this machine is going to be phenomenal with new set of eyes to look into brain and that will allow us to provide exclusive information to our referring physicians, neurologist and neurosurgeons. Well done Balaji.Keep going and reach new frontiers.Solapur radiologists are proud of your new possession.